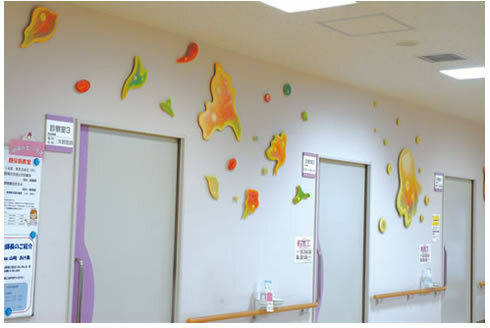 The Hospital Art Project > No.8 "silent breath"
The Hospital Art Project has been active in providing hospital environments with various works of art. Our mission is to touch the lives of people and instill rest and peace in the hospital setting. Our newest project entitled "Silent Breath" is a group of work from artist Hidetoshi Ueshima. It is the 8th exhibition in our seventh year and is presented in the waiting room. You can hear subtle sounds from his breathing from his art works. You can sense the slight warmth from his hands remaining in his art creations. Those subtle sounds and slight warmth are absorbed into the nature around- the vegetation, water, and light. Walking into the waiting room gives one the sense of letting go of anxiety and loneliness suffered from life stresses. It gives one a sense of connection. Life-front line in the medical field is also the place for art-expression. We would be grateful if you could join to renew and explore the concept of "what can art do for the medical care". We would certainly like to re-confirm together with you that this concept is "for the people who live it out". The "Hospital Art Project" is the wind breathing into the dreary institutionalized environments as "the sign of human presence". The wind breathes into hearts and minds of patients, families, visitors, and staff. We used to live a luxury life during the era of a growning economy. It looked as if we traveled on a luxury cruise ship. Such economical affluence provided us with full care-services, but today we are coming to a turning point where the capital fund is starting to be short and limited. We can no more take a luxury boat, but just a simple boat like the regatta. We now have to join and pull together to row the regatta to hopefully enjoy a slow life-journey. With this in mind, each of us should contribute a significant skill and unique character which we have potentially owned within ourselves. It is important for us to support our society in this way. This is an attitudinal change to joy, thus sensing the significance and meaning of life. Art has been part of our human history. In the past it reflected religions and at other times entertained the aristocracy. Today art can play a full and inherent role to make people feel the joy of life and reflect the human spirit. It is our hope and expectation that the "Hospital Art Project" represents the role of art as an integral part of human experience and has a valuable place in the hospital setting. 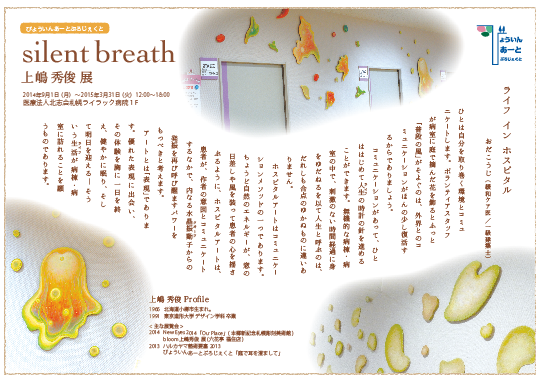 "silent breath" Leaflet 1 (PDF/1.9MB) *only available in Japanese. 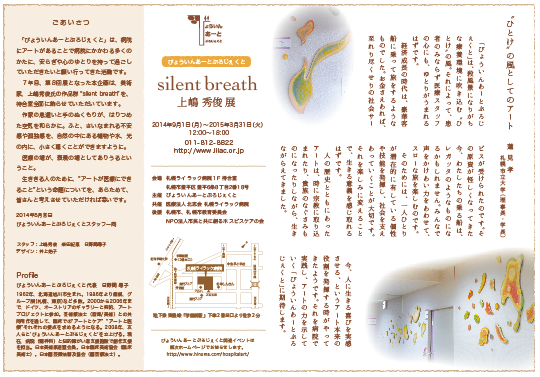 "silent breath" Leaflet 2 (PDF/2.4MB) *only available in Japanese.